The White-winged Parakeets or Canary-winged Parakeets (Brotogeris versicolurus) are also known as "Bee Bee" and "Pocket parrots." At 8.5 to 9.5 inches in length and weighing 65 to 75 grams, they are the largest of the brotogeris family. These boldly marked parakeets have an extensive native range throughout most of South America and can be found along the Amazon River, south over east, central and south Brazil, into north and east Bolivia, Paraguay, northern Argentina and eastern Peru. They are usually found near open forests, savannahs, seasonally flooded forests and river islands; but are also seen in suburban areas, parks and gardens - sometimes in flocks of up to about 50. 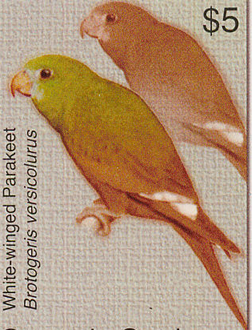 Until 1997, some taxonomists considered the White or Canary-winged Parakeet and the Yellow-chevroned Parakeet (Brotogeris chiriri) to be conspecific (of, or belonging to, the same species). Even though the Yellow-chevroned Parakeet (Brotogeris chiriri) has the yellow secondary covert feathers that can be seen in the Canary-winged Parakeet - it lacks white on the primary feathers of the wing. Confusion of these two species constitutes a serious problem. For example, the book "Parrots: A guide to parrot identification" (Juniper and Parr 1998) mixes characteristics of both species in their illustrations. 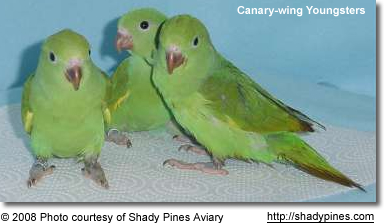 In addition, the Aviculturists in the United States commonly use the name Canary-winged Parakeet for B. chiriri and White-winged Parakeet for B. versicolurus - which adds to the confusion. In pet stores, the Yellow-chevroned Parakeets (B. chirir) are frequently sold as Canary-winged Parakeets (B. versicolurus) and visa versa. Populations of released or escaped pet birds have established themselves in California (Los Angeles / Hollywood, San Francisco, San Fernando and San Gabriel Valley), Florida (Miami), in New York City and Puerto Rico. However, the number of Canary or White-winged Parakeets has declined considerably since the early 1980s, while its cousin - the Yellow-Chevron Parakeets - have become more established. 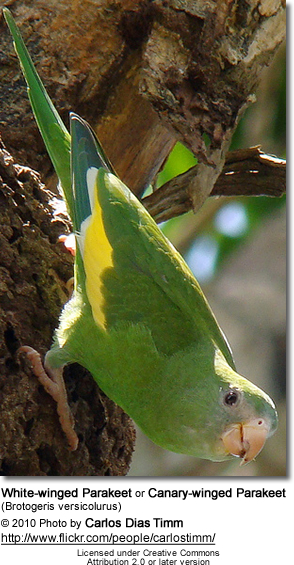 At this time, it is estimated that there are no more White-winged / Canary-winged Parakeets in Los Angeles, but some may still exist in Miami, Florida. Self sustaining populations are also found in Lima, Peru. Feral populations have adapted to feeding on blossoms and nectar. They are also known to frequent bird feeders. Canary-winged parakeets are small stocky parakeets - about 8.5 to 10 inches (21 to 25 cm) long -- nearly half of its length (4.3 inches or 10.8 cm) is made up by its pointed tail. They are slightly larger than grey-cheek parakeets and lovebirds. The plumage of the canary-wing islime green in color; a little darker green on the breast and underneath. The canary-winged parakeet has a trailing yellow edge on its folded wings. One of its most distinguished characteristics is the white wing patches that are most noticed when this parakeet is in flight. There are some blue marks under the tail and possibly on the wings. The eyes are brown; the beak is pale and the legs are pinkish in color. Like the other members of Brotogeris, they are not sexually dimorphic and must be sexed either by DNA or surgically. Young birds look like adults, but the overall plumage is duller in coloration. The Canary-winged Parakeets were at one time amongst the most commonly imported birds into the United States. As the numbers of the popular grey-cheeked parakeet declined, the Canary-wings have gained popularity, as they share many of the endearing personality traits of the grey-cheeks. They are not noted as being great talkers - but some say that Canary-wing Parakeets are better talkers than the popular grey-cheeks. They usually can pick up a few words or sentences. They are considered to be semi-noisy birds. These parakeets are generally friendly and grow very tame; however, they may be jealous of other pets. When they feel threatened, the canary-winged parakeets raise their wings and clap them together to make explosive sound. Minerals and Grit: They are often seen visiting barreiros (areas where mineral-rich soil is readily available) and river banks to feed on soil. A high-quality dry parrot mix (cockatiel dry food mix is fine). Dr. Harvey's Bird Food Mixes or Lafeber are convenient options that lack many of the harmful additives that are commonly found in commercial mixes and have a great variety of quality ingredients (including dried fruits, veggies, herbs / greens and even superfoods, such as bee pollen!) - in short: myriad nourishing ingredients that are not found in other commercially available bird mixes. However, our biggest grievance with their products is that they use sulphurated dried produce (a process which also requires chemicals), but it is very difficult to find mixes with unsulphurated fruits and veggies. You could just buy the seeds, nuts and grain mix and buy human-grade unsulphurated dried produce / greens as well as bee pollen and mix them in. Even organic trail mixes (WITHOUT CHOCOLATE!) work great. With a little creativity you can put a mix together that offers superior nutrition without the chemicals typically found in commercial brands. Sprouted Seeds: sprouted sunflower; sprouted millet spray. Sprouted or germinated seeds are usually more easily accepted by "seed addicts" than fresh fruits and vegetables. These parakeets are messy eaters and scatter any soft food over their cages (as is typical of most parrots). Carefully planning the set up will facilitate the daily clean-up. In flight, the canary-wing parakeets emit screeching calls that sounds like rapid series of shrill metallic notes. Pet birds can mimic sounds and may learn a few words.